• An all-metal stove with two cooking holes and the possibility of a water heater. 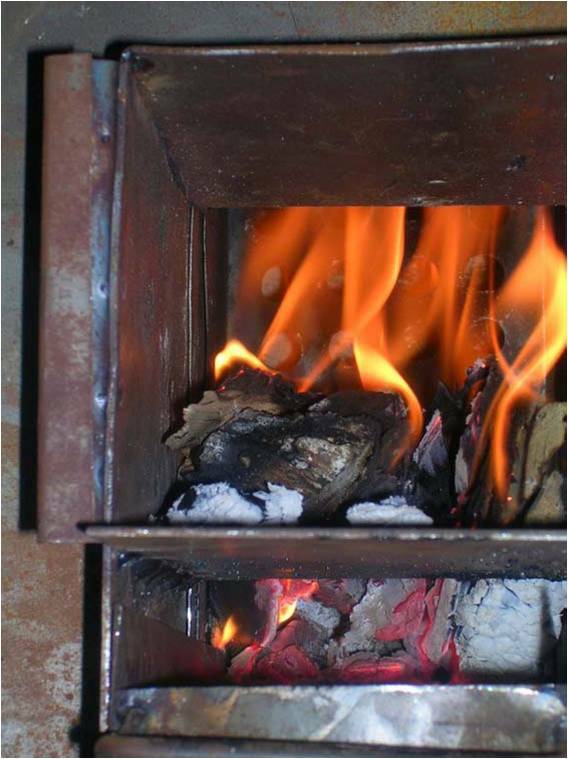 • An elevated mud stove (lower cost, less heat radiation), also with a water heater. Both stoves have chimneys. The present report is dealing with the all-metal cooking stove. The first model of the all-metal cooking stove has a two-hole top with a sunken pot design and is based on the “rocket” or elbow principle, improving the efficiency in two ways: by improved convection (sunken pot) and improved combustion through aeration from below (elbow). In addition, the lightweight stainless steel burning chamber is insulated, creating a hotter flame and better gas combustion, also increasing the efficiency. This design is currently being field tested to assess its acceptability by the villagers. The additional water heating facility will be developed after acceptance of the basic stove design. Variations of the stove (three holes) can be developed at a later stage.